Oliver Stone: Greed Is Legal In "Wall Street 2"
Director Oliver Stone attends the "South Of The Border" premiere at the Sala Grande during the 66th Venice Film Festival. Hollywood filmmaker Oliver Stone is again taking on the financial world in a sequel to 1987's successful "Wall Street," but this time he said greed is not only good — it's legal. Stone just finished filming "Wall Street 2" and dropped a few hints while talking to a class at American University late Wednesday that focuses on his work. The movie again stars Michael Douglas as corporate raider Gordon Gekko, a character who preached "greed is good" and earned Douglas an Academy Award in 1988. But this time Gekko takes a back seat to what Stone said are today's financial power players. "The individual Gekko would no longer exist in this new Wall Street," Stone said, referring to the boom before the recent financial meltdown. "The big players now are major banks and hedge funds … the money's too big." In the new film, he said, "greed is now legal." 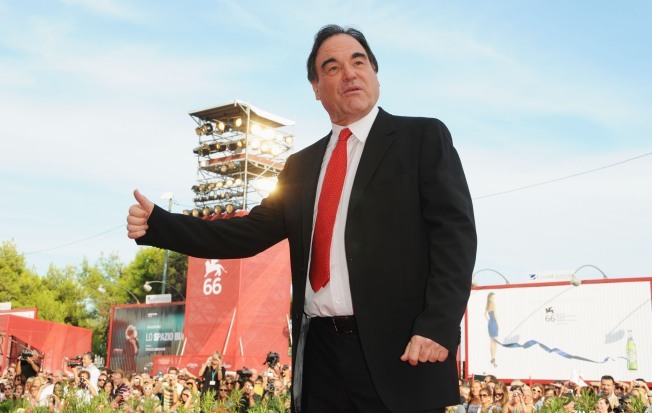 The movie, due out next year, is a complicated but familiar story with greed and envy as central themes, Stone told about 75 students in the "Oliver Stone's America" course, which also focuses on how popular historical consciousness is shaped. "Wall Street can be the engine of capitalism" and create opportunity, Stone said to one student. "But they increasingly have not done that because there's more money in speculation." Stone, 63, said he made the first "Wall Street" for his father, who was a stock broker, and as a symbol of an era of excess that only grew after the 1980s. Millionaires became billionaires in the decades that followed, and the U.S. government provided a staggering bailout this year after everything crashed, Stone said. "I don't think it's healthy," he said, "and I don't think I'm the only one." True to form, Stone also hammered mainstream media for too often following the government's lead on national security issues, and he criticized the defense industry and President Barack Obama. Ramping up the war in Afghanistan, Stone said, could be the beginning of the end for the United States. "This is a huge turning point," Stone told the class. "It's ironic a so-called liberal president would be the one to screw the lid on the coffin." The students studied Stone's work and read essays from his critics over the past several months, said Alyssa Pridgen, a 21-year-old senior from Baltimore. She said Stone has a "wacky perception" but that she was excited to hear his views on the financial crisis. "Even though he kind of plays with the facts, it's more about the overall message," said Erin Power, 21, of Long Island, N.Y.